Licorice (Glycyrrhiza glabra) is a perennial growing, deciduous plant that can grow to between 3 and 4 feet tall. 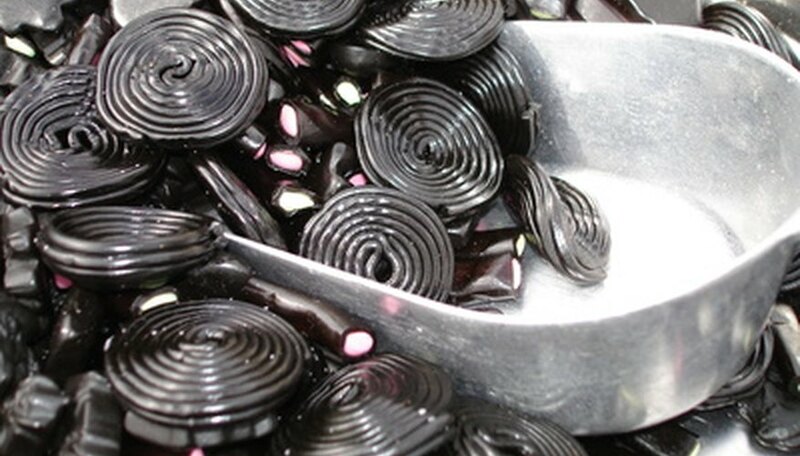 Besides its use in candy and confectionery, licorice extract is reputed to have anti-oxidant, anti-viral and anti-inflammatory properties. Growing licorice requires a little on-site preparation and a time commitment of between three and four years until the roots are mature enough to harvest. Scratch of knick off a section on each of the licorice seeds using a nail file or a piece of sandpaper. Set the licorice seeds into a bowl of water to soak for 24 hours. Fill up 4-inch plastic pots with a good quality potting mix. Pack the potting mix down firmly in each of the 4-inch pots. Place the 4-inch plastic pots into a tray that is sturdy enough to hold about 1 to 1 1/2 inches of water. Pour water into the tray, and allow the soil in the 4-inch pots to become saturated. Poke two to three 1/4-inch deep holes in the center of each 4-inch pot. Try and keep each hole about 1 inch apart from each other. Drop one licorice root seed into each hole. Use a pencil or your finger tip to push the licorice root seeds into the soil to ensure good seed-to-soil contact. Sprinkle no more than 1/4 inch of the potting mix over each of the licorice root seeds. Place the tray of 4-inch pots into an environment in your home where the temperature will remain fairly consistently around 60 to 70 degrees F. Try and provide filtered light for about 8 to 10 hours a day. Germination of licorice root seeds can begin as soon as seven days after planting and can sometimes take two weeks or longer. Keep the licorice root seedlings well-watered, but don't water so often the roots can rot. Transplant the licorice root seedlings in the spring as soon as the ground is soft enough to be cultivated. Cultivate the planting area thoroughly, and ensure you eliminate any weeds and their roots. According to Food and Crop Research, licorice root prefers being grown in soil that has a pH of above 6.0. Dig planting holes for each licorice root seedling. Each hole should be approximately the same depth as a 4-inch pot, but about 1 1/2 times its width. Space each planting hole about 30 to 36 inches apart from each other. Remove a licorice seedling from its pot by turning it upside down and sliding the pot off from the root system. Set a licorice root seedling into a previously dug planting hole. Scoop in garden soil in and around the seedling. Water each of the licorice root seedlings thoroughly. After the first year of growth, licorice root plants are fairly drought tolerant. Provide water only during extremely dry periods. Licorice root is typically ready for harvesting three to four years after planting. If you don't know the pH of your soil, you can buy a home test kit at most garden centers. Or contact your local agriculture extension office to inquire about having a soil test done. Plan on starting your licorice root seeds indoor in early to mid-autumn.